Ellis Geis dove along the crease line in an unsuccessful effort to put a shot on cage in the first quarter. An inspired run over the final month of the season came to and end for the Foothill Knights on Saturday when they ran into a Loyola Cubs defense that they simply couldn’t crack in a 13-4 loss in the US Lacrosse LA/OC championship game at Palos Verdes HS. 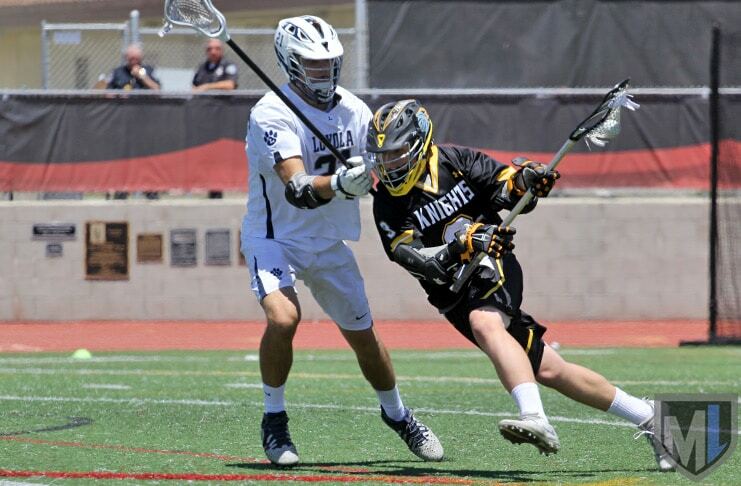 Loyola (21-4) won it’s second consecutive section crown, having beaten Corona del Mar in the title game last season. Until Saturday, Foothill had rolled through the playoffs, winning four games and the Orange County title by an average score of 12-5. That run included a semifinal win over San Clemente and a title-game win over defending champion Corona del Mar, with both victories avenging regular-season losses. The Knights (14-11) were a different squad in midseason, at one point losing seven of nine games heading into their Spring Break trip to Maryland. But they went 2-1 back East, then won six of their last eight in California, including the four-game OC title run. Until Saturday, when they ran into another team that had beaten them in the regular season (13-7 on March 11) and simply couldn’t avenge that one. Loyola raced out to a 4-1 lad after one quarter, led 8-2 at halftime and 12-3 heading to the fourth. The Knights battled but were simply overmatched. Loyola’s defense, an attacking, match-up zone that pressures on the perimeter while at the same time denying penetration, limited the Knights to only 18 shots in the game. Foothill had nearly as many turnovers (16) as it did shots. 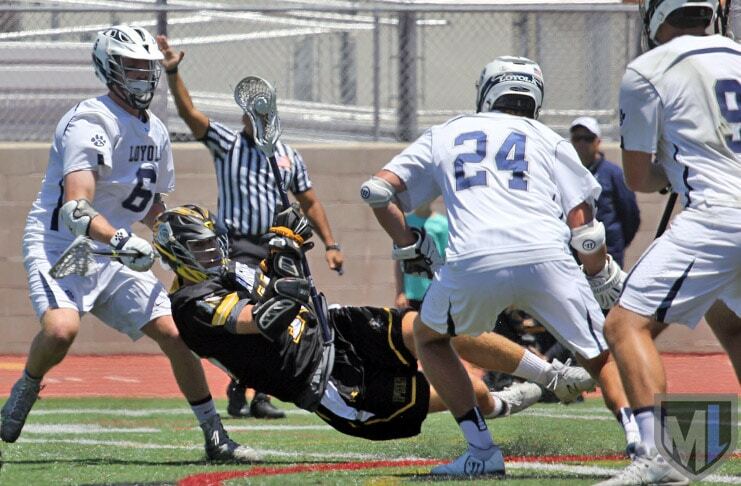 Defender Morgan Lewis of Loyola pressures out against Foothill attack Josh Fox. Anchored by goalie Joe Theuer (Tufts) and led by close defenders Nick Mohler (Boston University), Niko Econn (Air Force) and Morgan Lewis (Washington College), the Cubs allowed an average of only 5.0 goals per game over the course of the season and steamrolled through the LA/Ventura playoffs, allowing only 20 goals in five playoff games. In 25 games over the course of the 2017 season, the Cubs allowed an opponent to reach double digits only twice. Saturday, the Cubs’ zone gave Foothill fits. The Knights came in averaging 12 goals per game over their last six contests and had not scored fewer than nine in that span. Against Loyola, though, they managed to put only 10 shots on goal and didn’t score their third goal until 14 minutes remained. By that time, the Cubs led 10-3 and the outcome was hardly in doubt. To be honest, the outcome wasn’t really in doubt at halftime, or even after the first quarter. Loyola senior Ryder Mora (Maryland) had two goals and an assist as the Cubs took a 3-1 lead six minutes into the game. Loyola dominated possession time and peppered the Foothill cage with shots. Knights goalie Austin Mann (Whittier) had four saves in the first quarter, preventing an early blowout. He finished with 10 saves. Knights senior Austin Mann made 10 saves against Loyola, including four in the first period. Less than five minutes into the second period, though, Loyola’s lead was 6-1, and the Cubs tacked on two more in the final 1:30 of the half to lead 8-2 at the break. While a six-goal margin in a championship lacrosse game usually isn’t insurmountable, it was becoming readily apparent that this one would be. Loyola scored in its half-field offense (7 goals) and in transition or unsettled situations (6 goals). The goals came from midfielders (4 goals) and attacks (9 goals). They were assisted (5 goals) and not (8 goals). Mora led the Cubs with five goals and two assists, and Henry Hasenberg and Wes Priestley each scored two. Mason O’Hanlon (Babson) and Jonathan Partamian (Syracuse) each had a goal and an assist, and Joe Peterson and Dom Trageser each scored one goal. Defender Mohler had an assist in transition. 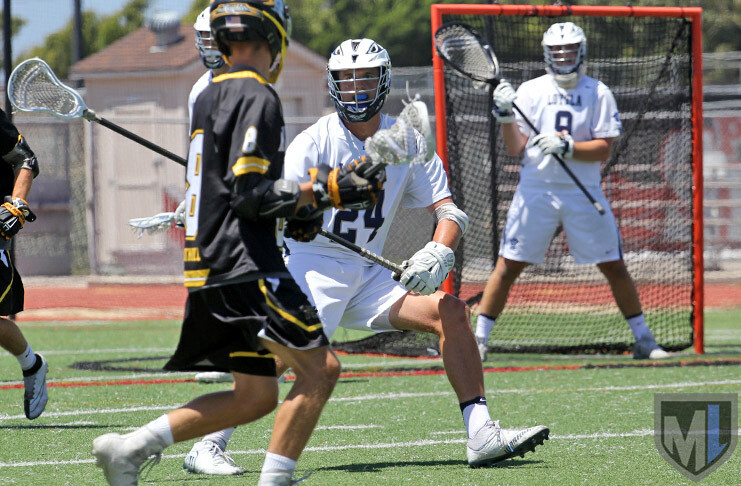 While Loyola’s offense certainly was red hot, the Cubs’ dominance started at the face-off dot, where junior Aidan Hesse won 12 of 18 draws, and continued at the defensive end, where their defense was all but impenetrable. Loyola’s zone defense manages to pressure the ball on the perimeter while still protecting the interior. Junior attack Ellis Geis (Denver), who scored 62 goals on the season, scored only one on Saturday. On a number of occasions, the 6-foot-4 scorer resorted to lunging or diving between Loyola defenders to get a look at the cage, frequently ending up on the ground. He was helped off trainers twice. 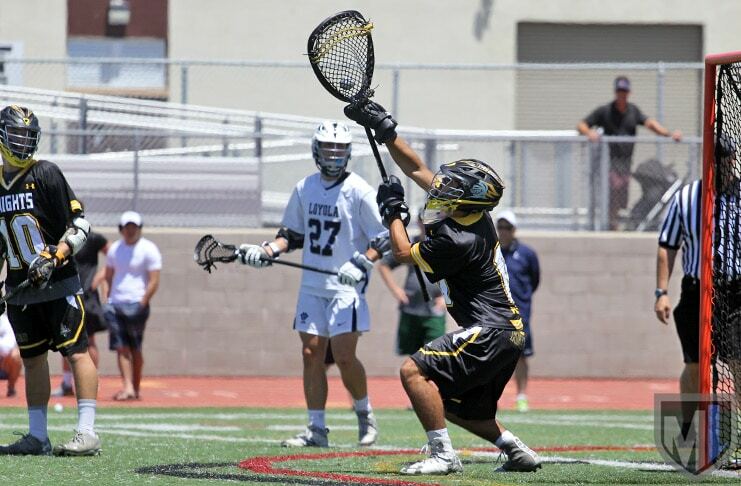 Foothill managed to put 10 of its 18 shots on cage, but Loyola’s Theuer saved six of them. Senior Cole Falbo scored two goals for the Knights, and Geis and LSM George Dalis each scored one.